Mathura, April 11: Bharatiya Janata Party (BJP) MP from Mathura Lok Sabha constituency, Hema Malini, has been in news of late thanks to some of her weird comments. The film star turned politician recently attracted attention when she participated in farming work in her constituency. However, Malini's act was termed as "poll stunt" by many as the pictures went viral. And now, the MP was caught on camera advising that samosas, Frooti and people were spoiling the monkeys. Mathura Lok Sabha Constituency in Uttar Pradesh: Candidates, Current MP, Polling Date and Election Results 2019. On Thursday, Hema Malini was asked about the problems and menace caused by monkeys in her constituency. Hema Malini, in her reply, said that "monkeys also need to coexist," and added that the monkeys have been spoiled by the people as they "offer Samosas (an Indian snack) to monkeys instead of fruits". The Mathura MP then advised the people to offer only fruits to the monkeys. 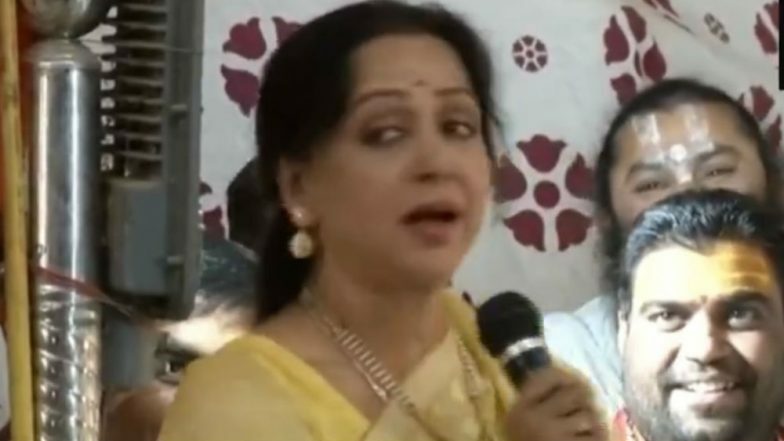 Hema Malini Forgets Her Contribution to Mathura as BJP MP, Says 'Have Done Lot of Work, But Can't Remember Right Now'; Watch Video. In a similar incident, Hema Malini had goofed up recently when she was asked about the work she had done in her constituency. She also joined farmers and tried her hand at cutting the wheat crop in this region in Uttar Pradesh, inviting scorn from the opposition. Hema Malini, talking to a reporter, said that she had done a lot of work in her constituency but couldn't remember and claimed that "the amount of work done by me is so much, that can't recall it right now." Voting in Mathura will take place on April 18, in second phase of voting for the Lok Sabha Elections 2019.